The Southern Baptist Convention (SBC) is a Christian denomination based in the United States of America. It is the world's largest Baptist denomination and the largest Protestant body in the United States, with nearly 16 million members as of 2012. This also makes it the second largest Christian body in the United States, after the Catholic Church. The word Southern in Southern Baptist Convention stems from it having been founded and rooted in the Southern United States, following a split from American Civil War, another split occurred when most freedmen set up independent congregations. Many set up their own Baptist churches, regional associations, and state and national conventions, such as the National Baptist Convention, which became the second largest Baptist convention. Others joined new African-American denominations, chiefly the African Methodist Episcopal Church. Since the 1940s, the SBC has moved away from some of its regional and historic identification. Especially since the late twentieth century, the SBC has sought new members among minority groups and become much more diverse. In addition, while still heavily concentrated in the Southern US, the SBC has member churches across the United States and 41 affiliated state conventions. At its annual convention in 2012, the SBC elected as president Fred Luter Jr., the first African American to hold the position. An SBC presidential term is for one year, with a term limit of two terms. Each president is elected by Messengers sent by each local church at the SBC annual meeting. Since Luter ran unopposed, per the by-laws of the Convention, only a single ballot was cast by the Recording Secretary to secure his election. Because of the historic nature of the vote, the assembly was asked to rise in support of the vote, which the messengers did enthusiastically. Luter was re-elected president for a second (and final) term at the 2013 meeting. Southern Baptists emphasize the significance of the individual conversion experience which is affirmed by the person having complete immersion in water for a believer's baptism. As a result, they reject the practice of infant baptism. SBC churches are evangelical in doctrine and practice. Specific beliefs based on biblical interpretation can vary somewhat due to their congregational governance system which allows autonomy to each individual local church. Most early Baptists in the British colonies came from England in the 17th century, after the established William Screven. A Baptist church was formed in Virginia in 1715 through the preaching of Robert Norden and another in North Carolina in 1727 through the ministry of Paul Palmer. The Baptists operated independently of the state-established Anglican churches in the South, at a time when non-Anglicans were prohibited from holding political office. By 1740, there were about eight Baptist churches in the colonies of Virginia, North Carolina, and South Carolina, with an estimated 300–400 members. New members, both black and white, were converted chiefly by Baptist preachers who traveled throughout the South during the 18th and 19th centuries, in the eras of the First Great Awakening and Second Great Awakening. Baptists welcomed African Americans, both slave and free, allowing them to have more active roles in ministry than did other denominations by licensing them as preachers and, in some cases, allowing them to be treated as equals to white members. As a result, black congregations and churches were founded in Virginia, South Carolina, and American Revolution. Some black congregations kept their independence even after whites tried to exercise more authority after the Nat Turner slave rebellion of 1831. Isaac (1974) analyzes the rise of the Baptist Church in Virginia, with emphasis on evangelicalism and social life. There was a sharp division between the austerity of the plain-living Baptists, attracted initially from yeomen and common planters, and the opulence of the Anglican planters, the slaveholding elite who controlled local and colonial government in what had become a slave society by the late eighteenth century. The gentry interpreted Baptist church discipline as political radicalism, but it served to ameliorate disorder. The Baptists intensely monitored each other's moral conduct, watching especially for sexual transgressions, cursing, and excessive drinking; they expelled members who would not reform. In Virginia and in most southern colonies before the Revolution, the Church of England was the state-established church and supported by general taxes, as it was in Britain. It opposed the rapid spread of Baptists in the South. Particularly in Virginia, many Baptist preachers were prosecuted for "disturbing the peace" by preaching without licenses from the Anglican Church. Both Patrick Henry and the young attorney James Madison defended Baptist preachers prior to the American Revolution in cases considered significant to the history of religious freedom. In 1779, Thomas Jefferson wrote the Virginia Statute for Religious Freedom, enacted in 1786 by the Virginia General Assembly. Madison later applied his own ideas and those of the Virginia document related to religious freedom during the Constitutional Convention, when he ensured that they were incorporated into the national constitution. ^ . The statistical figures used in the 2011 Yearbook were collected in 2008. ^ a b c d e f g .
^ Raboteau 1979, p. 188. ^ Raboteau 1979, p. 137. ^ . The era of conservative resurgence was accompanied by the erosion of more-liberal members (see, e.g., G. Avery Lee). ^ contain a discussion of attitudes regarding gender and their relationship to ministry. ^ (with 2005 estimate from Convention figures). Baptist Men on Mission, formally known as Brotherhood, is the mission organization for men in Southern Baptist Churches. Ethics & Religious Liberty Commission, is an entity of the Southern Baptist Convention that is dedicated to addressing social and moral concerns and their implications on public policy issues from City Hall to Congress. Its mission is "To awaken, inform, energize, equip, and mobilize Christians to be the catalysts for the Biblically-based transformation of their families, churches, communities, and the nation." The Ethics and Religious Liberty Commission was formerly known as the Christian Life Commission of the SBC. Among the more visible organizations within the North American Mission Board is Southern Baptist Disaster Relief. In 1967, a small group of Texas Southern Baptist volunteers helped victims of Hurricane Beulah by serving hot food cooked on small "buddy burners." In 2005, volunteers responded to 166 named disasters, prepared 17,124,738 meals, repaired 7,246 homes, and removed debris from 13,986 yards. Southern Baptist Disaster Relief provides many different types: food, water, child care, communication, showers, laundry, repairs, rebuilding, or other essential tangible items that contribute to the resumption of life following the crisis – and the message of the Gospel. All assistance is provided to individuals and communities free of charge. SBC DR volunteer kitchens prepare much of the food distributed by the Red Cross in major disasters. 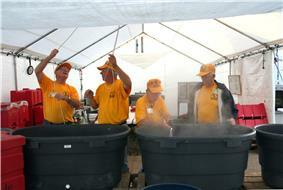 Members of a Southern Baptist Convention Disaster Relief team prepare to cook food after the Greensburg, Kansas Tornado in 2007. The Southern Baptist Convention was organized in 1845 primarily for the purpose of creating a mission board to support the sending of Baptist missionaries. The evangelism and church planting in the U.S. and Canada, while the International Mission Board, or IMB, (originally the Foreign Mission Board) in Richmond, Virginia, sponsors missionaries to the rest of the world. The Convention's confession of faith, the Baptist Faith and Message, technically is not binding on churches or members due to the autonomy of the local church. Politically and culturally, Southern Baptists tend to be conservative. Most oppose the use of alcohol as a beverage, homosexual activity, and abortion with few exceptions. A basic Baptist principle is the autonomy of the local church. The Convention is therefore conceived as a cooperative association by which churches can pool resources rather than as a body with any administrative or ecclesiastical control over local churches. It maintains a central administrative organization in Nashville, Tennessee. The SBC's Executive Committee exercises authority and control over seminaries and other institutions owned by the Southern Baptist Convention. However, the Executive Committee has no authority over affiliated state conventions, local associations, individual churches or members. The Southern Baptists' typical form of government is congregationalist: each local church is autonomous without formal lines of responsibility to organizational levels of higher authority. These include the Hispanic Baptist Theological School in San Antonio, Baylor University's  In some cases, groups have withdrawn from the SBC because of its conservative trends. On November 6, 2000, The Baptist General Convention of Texas voted to cut its contributions to SBC seminaries and reallocate more than $5 million in funds to three theological seminaries in the state which members believe were more moderate. The decline in SBC membership may be more pronounced than these statistics indicate because Baptist churches are not required to remove inactive members from their rolls. 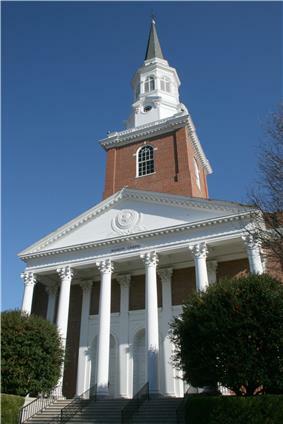 In addition, hundreds of large moderate congregations have shifted their primary allegiance to other Baptist groups, such as the American Baptist Churches USA, the Alliance of Baptists or the Cooperative Baptist Fellowship, but have continued to remain nominally on the books of the Convention. Their members are thus counted in the SBC's totals although these churches no longer participate in the annual SBC meetings or make more than the minimum financial contributions. On the other hand, the state conventions of Mississippi and Texas report an increasing portion of minority members. In 1990 5% of SBC congregations were non-white. In 2012, the proportion of SBC congregations that were of other ethnic groups (African American, Latino and Asian) had increased to 20%. 60% of the minority congregations were found in Texas, particularly in the suburbs of Houston and Dallas. This decline in membership and baptisms has prompted some SBC researchers to describe the Convention as a "denomination in decline". Former SBC president Frank Page declared that if current conditions continue, half of all SBC churches will close their doors permanently by the year 2030. This assessment is supported by a recent survey of SBC churches which indicated that 70 percent of all SBC churches are declining or are plateaued with regards to their membership. Data from church sources and independent surveys indicate that since 1990 membership of SBC churches has declined as a proportion of the American population. Historically, the Convention grew throughout its history until 2007, when membership decreased by a net figure of nearly 40,000 members. The total membership, of about 16.2 million, was flat over the same period, falling by 38,482, or 0.2 percent. An important indicator for the health of the denomination is new baptisms, which have decreased every year for seven of the last eight years. As of 2008, they had reached their lowest levels since 1987. Membership continued to decline from 2008 to 2012. SBC's statistical summary of 2014 recorded a loss of 236,467 members, their biggest one-year decline since 1881. The SBC has 1,161 local associations and 42 state conventions, and fellowships covering all 50 states and territories of the United States. The five states with the highest rates of membership in the SBC are Texas, Georgia, North Carolina, Florida, and Tennessee. Texas has the largest number of members with an estimated 2.75 million. The SBC reports having 15.74 million members in 46,125 churches throughout the US in 2013. On average, 37 percent of the membership (5,834,707 members, guests and non-member children) attend their churches' primary worship services. Worship services usually include hymns, prayer, choral music by a choir, soloist, or both, the reading of Scripture, the collection of offerings, a sermon, and an invitation to respond to the sermon. Most Southern Baptists observe a low church form of worship, which is less formal and uses no stated liturgy. People may respond during the "invitation" by receiving Jesus Christ as "Lord and Saviour" and beginning Christian discipleship, entering into vocational ministry, joining the church, or making some other publicly stated decision. The crystallization of SBC positions on gender roles and restrictions of women's participation in the pastorate contributed to the decision by members now belonging to the Cooperative Baptist Fellowship (CBF) to break from the SBC in 1991. Autonomous local congregations are not required to adopt male-only pastors as their theological position. Neither the BF&M nor the SBC provides any mechanism to trigger automatic expulsion of congregations that adopt practices or theology contrary to the BF&M. However, going against the SBC's official gender protocol, defended on biblical grounds, opens a local Baptist congregation to severe criticism and even further penalties. Some SBC churches that have installed women as their pastors have been excluded from membership in their local associations of Baptist churches; a smaller number have been expelled from their state conventions. As individual churches affiliated with the SBC are autonomous, local congregations cannot be compelled to adopt a male-only pastorate. Beginning in the early 1970s, as a reaction to their perceptions of various "women's liberation movements", the Southern Baptist Convention, along with several other historically conservative Baptist groups, began as a body to assert its view of the propriety and primacy of what it deemed "traditional gender roles". In 1973, at the annual meeting of the Southern Baptist Convention, delegates passed a resolution that read in part: "Man was not made for woman, but the woman for the man. Woman is the glory of man. Woman would not have existed without man." In 1998, the SBC appended a male leadership understanding of marriage to the 1963 version of the Baptist Faith and Message, with an official amendment: Article XVIII, "The Family". In 2000, it revised the document to reflect support for a male-only pastorate with no mention of the office of deacon. This is a long-standing practice of the great majority of SBC churches, based on the idea that the church and Christ existed simultaneously. The BF&M holds to memorialism, which is the belief that the Lord's Supper is a symbolic act of obedience in which believers commemorate the death of Christ and look forward to his Second Coming. The majority of Southern Baptist churches practice open communion, but the frequency of observance varies. It is commonly observed quarterly; though, some churches offer it monthly and a small minority offers it weekly. Sanctity of life — Abortion and many forms of birth control are immoral as life begins at the moment of conception. Women in ministry — Women are of equal value to men and participate on Southern Baptist boards, faculties, mission teams, writer pools, and professional staffs. However, women are not eligible for pastorship. In 2012, a LifeWay Research survey of SBC pastors found that 30 percent of congregations identified with the labels Calvinist or Reformed, while 30 percent identified with the labels Arminian or Wesleyan. Ed Stetzer, president of LifeWay Research, explaned that "historically, many Baptists have considered themselves neither Calvinist nor Arminian, but holding a unique theological approach not framed well by either category". Nevertheless, the survey also found that 60 percent of SBC pastors were concerned about Calvinism's impact within the Convention. Nathan Finn notes that the debate over Calvinism has "periodically reignited with increasing intensity", and that non-Calvinists "seem to be especially concerned with the influence of Founders Ministries," while Calvinists "seem to be particularly concerned with the influence of revivalism and Keswick theology." The general theological perspective of the churches of the Southern Baptist Convention is represented in the Baptist Faith and Message (BF&M). The BF&M was first drafted in 1925 as a revision of the 1833 New Hampshire Confession of Faith. It was revised significantly in 1963 and again in 2000, with the latter revision being the subject of much controversy, particularly in regards to the role of women in the church. The BF&M is not considered to be a creed, such as the Nicene Creed. Members are not required to adhere to it. Churches and state conventions belonging to the SBC are not required to use it as their statement of faith or doctrine, though many do in lieu of creating their own statement. Despite the fact that the BF&M is not a creed, faculty in SBC-owned seminaries and missionaries who apply to serve through the various SBC missionary agencies must affirm that their practices, doctrine, and preaching are consistent with the BF&M. The messengers of the 2012 annual meeting in New Orleans voted to adopt the descriptor "Great Commission Baptists." The legal name of the convention remains "Southern Baptist Convention," but churches and convention entities can voluntarily use the descriptor. By the early 21st century, there were increasing numbers of ethnically diverse congregations within the convention. In 2008, almost 20 percent were estimated to be majority African American, Asian or Hispanic. The SBC had an estimated one million African-American members. The convention has passed a series of resolutions recommending the inclusion of more black members and appointing more African-American leaders. In the 2012 annual meeting, the Southern Baptist Convention elected Fred Luter Jr. as its first African-American president. He had earned respect by his leadership skills shown in building a large congregation in New Orleans. In 1995, the Convention voted to adopt a resolution renouncing its racist roots and apologizing for its past defense of slavery, segregation, and white supremacy. This marked the denomination's first formal acknowledgment that racism had a profound role in its early and modern history. The convention recognized that the demographics of the United States were changing and has subsequently made an effort to recruit new members among minority populations. 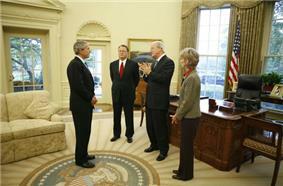 President Oval Office at the White House. Pictured with the President are Dr. Morris Chapman, left, Dr. Frank Page and his wife Dayle Page. B. H. Carroll Memorial Building, the Southwestern Baptist Theological Seminary's main administrative building. In the "Whitsitt controversy" of 1896–99, Dr. William H. Whitsitt, a professor at Southern Baptist Theological Seminary, suggested that, contrary to earlier thought, English Baptists did not begin to baptize by immersion until 1641, when some Anabaptists, as they were then called, began to practice immersion. This overturned the idea of immersion as the practice of the earliest Baptists, as some of the Landmarkists contended. In the 1850s–1860s, a group of young activists called for a return to certain early practices, or what they called Landmarkism. Other leaders disagreed with their assertions, and the Baptist congregations became split on the issues. Eventually the disagreements led to the formation of Gospel Missions and the American Baptist Association (1924), as well as many unaffiliated independent churches. One historian called the related James Robinson Graves—Robert Boyte Crawford Howell controversy (1858–60) the greatest to affect the denomination before that of the late 20th century involving the "fundamentalist-moderate" break. Into the 1960s and the Civil Rights era, most Southern Baptist pastors and most members of their congregations rejected Racial integration and accepted white supremacy, further alienating African Americans. According to historian and former Southern Baptist Wayne Flynt, "The [Southern Baptist] church was the last bastion of segregation." Free blacks in the North had founded churches and denominations in the early nineteenth century that were independent of white-dominated organizations. In the freedmen. After the Civil War and emancipation, blacks wanted to practice Christianity independently of white supervision. They had interpreted the Bible as offering hope for deliverance, and saw their own exodus out of slavery as comparable to The Exodus. They quickly left white-dominated churches and associations and set up separate state Baptist conventions. 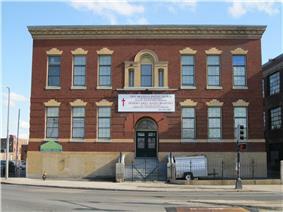 In 1866, black Baptists of the South and West combined to form the Consolidated American Baptist Convention. In 1895 they merged three national conventions to create the National Baptist Convention, USA, Inc.. With 8 million members, it is today the largest African-American religious organization and is second in size to the Southern Baptist Convention. Generally whites in the South required that black churches be under the supervision of white ministers and associations. In practice, as noted above, in churches with mixed congregations, blacks were made to sit in segregated seating, and white preaching sometimes quoted Biblical stipulations that slaves should accept their places and try to behave well toward their masters. First African Baptist Church, Savannah, Georgia, constructed 1856. A secondary issue that disturbed the Southerners was the perception that the American Baptist Home Mission Society did not appoint a proportionate number of missionaries to the southern region of the US. This was likely a result of the Society's not appointing slave owners as missionaries. Baptists in the North preferred a loosely structured society composed of individuals who paid annual dues, with each society usually focused on a single ministry. In 1844, missionary. The Home Mission Society's board refused to appoint him, noting that missionaries were not allowed to take servants with them (so he clearly could not take slaves) and that they would not make a decision that appeared to endorse slavery. Southern Baptists considered this an infringement of their right to determine their own candidates. From the Southern perspective, the Northern position that "slaveholding brethren were less than followers of Jesus" effectively obliged slaveholding Southerners out of the fellowship. In addition, from the early decades of the nineteenth century, many Baptist preachers in the South argued in favor of preserving the right of ministers to be slaveholders (which they had earlier prohibited), a class that included prominent Baptist Southerners and planters. Black congregations were sometimes the largest of their regions. For instance, by 1821 Gillfield Baptist in Petersburg, Virginia, had the largest congregation within the Portsmouth Association. At 441 members, it was more than twice as large as the next ranking church. Before the Nat Turner slave rebellion of 1831, Gillfield had a black preacher. Afterward, it could not call a black preacher until after the American Civil War and emancipation. After Turner's slave rebellion, whites worked to exert more control over black congregations and passed laws requiring white ministers to lead or be present at religious meetings (many slaves evaded these restrictions). After first attracting yeomen farmers and common planters, in the nineteenth century, the Baptists began to attract major planters among the elite. While the Baptists welcomed slaves and free blacks as members, whites controlled leadership of the churches, their preaching supported slavery, and blacks were usually segregated in seating. Slavery in the 19th century became the most critical moral issue dividing Baptists in the United States. Struggling to gain a foothold in the South, after the American Revolution, the next generation of Baptist preachers accommodated themselves to the leadership of southern society. Rather than challenging the gentry on slavery and urging manumission (as did the Quakers and Methodists), they began to interpret the Bible as supporting the practice of slavery (see Slavery in the Bible) and encouraged good paternalistic practices by slaveholders. They preached to slaves to accept their places and obey their masters. In the two decades after the Revolution during the Second Great Awakening, Baptist preachers abandoned their pleas that slaves be manumitted. In 1814, Baptists unified nationally under what became known informally as the Triennial Convention (because it met every three years) based in Philadelphia. It allowed them to join their resources to support missions abroad. The Home Mission Society, affiliated with the Triennial Convention, was established in 1832 to support missions in frontier territories of the United States. By the mid-19th century, numerous social, cultural, economic, and political differences existed among business owners of the North, farmers of the West, and planters of the South. The most divisive conflict was primarily over the deep sectional issue of slavery and secondarily over missions.